The Prepara Herb Mini-Savor Keeps Things Fresh A Little Longer | OhGizmo! We’ll be honest, the last time we bought some herbs for cooking, we ended up throwing most of them out after five days. Why? Well, watching cooking shows convinced us “fresh is best”, so instead of buying the easily kept dried herbs, we bought the live ones. Used them in the recipe once and then… just put them in the fridge. You can guess the rest. Had we bought the above Prepara Herb-Savor, it would have given us a three week window in which to think of another meal to make. The little herbs would have had their bases soaking in fresh water, all the while looking like we had some futuristic space pods in the fridge. And that’s a win for everyone. 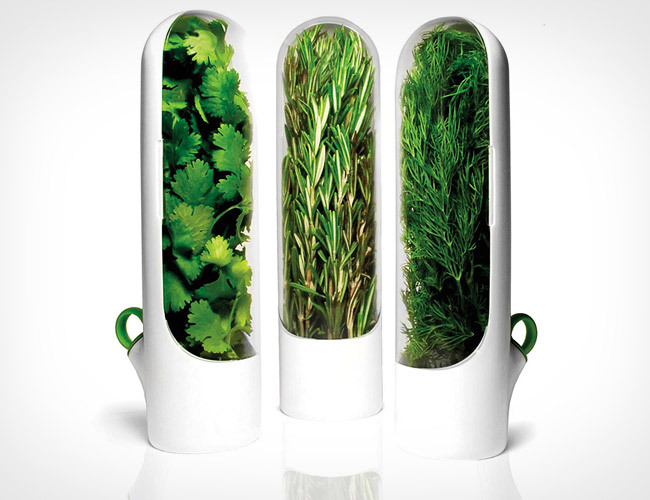 Made from BPA-free plastic, the Prepara Herb-Savour is $15 for 1 and $30 for three.